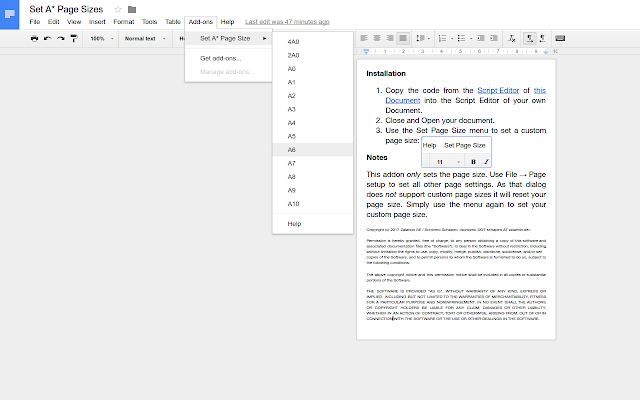 While Google Docs is a great productivity tool, it still lacks some very simple and common functionality, for example setting a custom page size. Google Slides and Google Drawings allows setting custom sizes, but not Google Docs. Luckily there are several add-ons available for this purpose, for example Page Sizer is a little open source add-on on the Chrome Web Store. Unfortunately in many enterprise setups of G Suite access to the Chrome Web Store and to Google Drive add-ons is disabled for security reasons: the admins cannot white-list single add-ons and are afraid of add-ons that leak company data. Admins can only white list add-ons from the G Suite Marketplace. 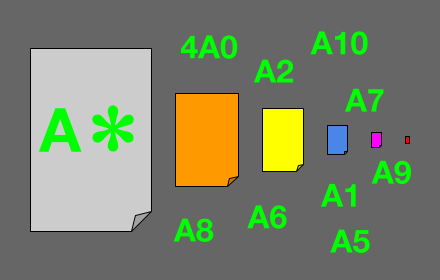 To solve this problem for everybody I created a simple Docs add-on Set A* Page Size that adds a menu to set the page size to any of 4A0 - A10. 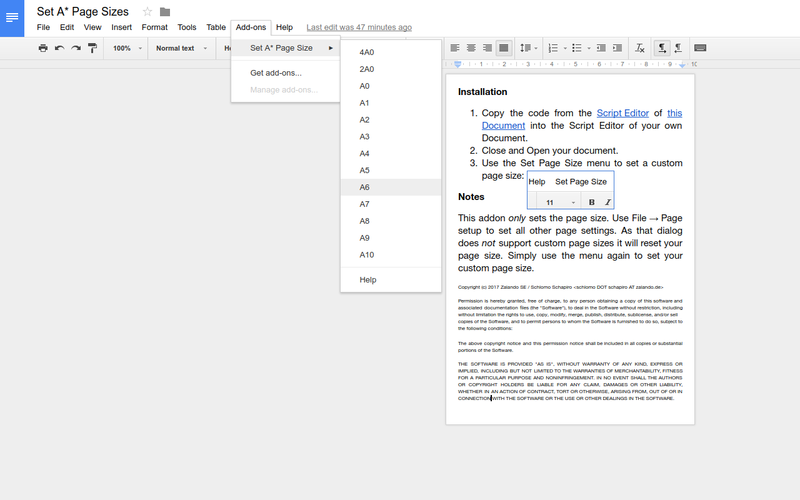 Install the add-on in your Google Docs. Works for gmail.com accounts and for G Suite accounts that allow add-on installation. It makes the add-on available in all your documents. Ask their domain admins to add the add-on from the G Suite Marketplace. This will add the add-on for all users and all their documents in the domain. The source code is public (MIT License) and open for review. Copy & Paste the code into their own document — this requires no extra permissions and it does not involve the domain admins. It adds the add-on only to the current document. Copy the code from the Script Editor of this Document into the Script Editor of your own Document. Close and Open your document. I hope that you will find this little add-on useful and that you can learn something about Google Apps Scripting from it.